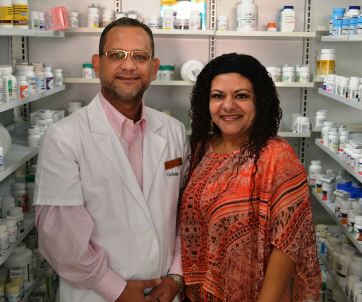 Our pharmacies are a family owned and operated business. Amgad (Alex) Masih, RPh is the Pharmacist-In-Charge and Iman Masih, his wife is the Office Manager. Together they have 3 beautiful children and try their hardest to balance between dedication to the pharmacies and their home lives. Alex has over 20 years experience as a pharmacist. Through Los Angeles and Ventura Counties and Foreign Countries, he has been able to gain an all around pharmacy experience while working at Hospitals, Chain Drug Stores, Independent Pharmacies, Long Term Care Pharmacies, and with Hospices. While working for the “Large Corporations”, Alex experienced that it limited his ability to truly help and support the patients because of politics, monthly goals, etc.. As a result, he decided to open his own pharmacy where he can utilize his experience, his expertise, and his time to help his patients. In January 2008, Golden Life Long Term Care Pharmacy, originally located in Eagle Rock, CA was purchased. The Long Term Care Pharmacy serves many facilities. Our professional staff is looking forward to assisting you with your prescriptions needs and are more than happy to answer any question you may have about your presciption.